It took so long for summer to arrive that I’m reluctant to bring up the any talk of the holidays. But the truth is, the holidays are just around the corner and it’s never too early to start preparing. 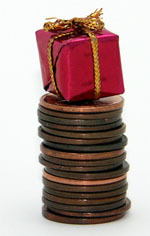 If your budget is more on the thrifty side, this is the time of year to really start working on gifts for the holidays. Watch the clearance sales. Most of the big retailers such as Target, Walmart , Kmart and Amazon all have major toy clearance sales as they get ready for this season’s hot new toys. Stock up for Christmas and birthdays. Stock up on canning jars. Gifts in a jar and homemade preserves can make excellent gifts for friends and teachers. It’s best to buy the jars now since there are usually coupons available and sales. If you wait until December, you may be out of luck. Start thinking of photo gifts. During the weeks leading up to the holidays you’ll see all kinds of great deals on photo prints and gifts. I’ve seen free photo books, free collages, free calendars, free mugs and more. Most of these deals only ask that you pay shipping. Be ready with quality photos to upload so you can take advantage of some great deals on a memorable keepsake gift. Start thinking about crafty gifts. The Back-to-School shopping season is an excellent time of year to stock up on crayons, markers, journals, notepads, pencils, pens and glue. Use these items for stocking stuffers, or put them together in a gift basket for a child who loves art or for a teacher gift. If you’re in to sewing, start watching for sales on fabric and notions so that you can have plenty of time to get those projects finished before the holidays. Start thinking magazine gifts. Many magazine subscriptions take 8 to 12 weeks for the subscription to start, so if you want to give someone a subscription that starts right after Christmas you’ll need to plan accordingly. Pay attention to your own magazine renewals – many of them allow you to give a gift subscription when you renew yours. Start planning a budget for the holidays and make a plan to stay on top of all the holiday tasks and you’ll find the holidays are a lot less stressful. Note: This post contains affiliate links that help support this site at no cost to you. Please read my full disclosure policy for more information. Thanks! I can’t believe the holidays are around the corner. Great tips for us to remember as we look toward the next few months!! !